Get this amazing money-making resource at a 46% discount for a limited time! Why settle for low-paying club gigs, when you could be making $5,000 ... $10,000 ... even $50,000 or more playing the college music circuit? You know the drill. Getting gigs at the obvious, high-profile live music clubs is like pulling teeth. If you can get someone to actually return your phone call or email, you're lucky to get an opening slot ... playing for free. Even when you work your way up to a headlining slot, the money is nothing to shout about. You play these gigs to stroke your ego and make a few bucks. But it's rarely enough to release you from the bonds of your day job. I'm talking about the lucrative college market, where hundreds of independent acts are making good money and thriving in ways they simply never could playing traditional venues. Ari Nisman, president of Degy Entertainment, is one of the top college music booking agents in the U.S. He knows the opportunities and pitfalls of this often overlooked market. And now he's baring his soul and revealing all of his college booking secrets for the first time. One unsigned solo act on Ari's roster grossed $118,113.00 in college shows in one year alone. Another unsigned, country-rock band from Nashville raised their price from $750 to $2,250 per show in the college market and brought in $34,900 in a four-month period from college dates. Four showcasing acts Ari represents picked up more than 40 college dates each at college conferences. My friend John Taglieri, a successful indie musician who has booked many good-paying college gigs working with Ari, sat down with the agent and grilled him for more than two and a half hours. The entire interview was recorded and is available now -- along with a 54-page transcript of their entire conversation. The key to this lucrative market is tapping into the National Association for Campus Activities (NACA), as well as the Association for the Promotion of Campus Activities (APCA). 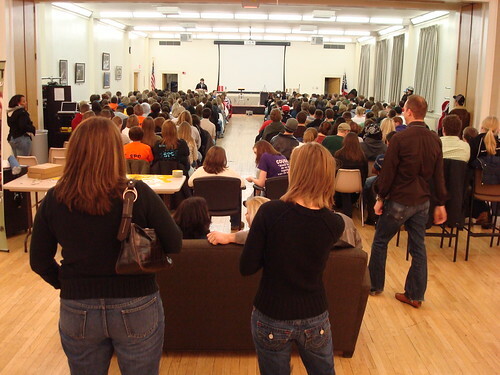 These organizations have regional and national conferences where musical acts of all kinds showcase in front of hundreds -- sometimes even thousands -- of college campus entertainment buyers. Understanding the two "Price Thresholds"
Ready to start earning $1,000 ... $5,000 ... or $10,000 for your next string of live shows? Download the entire two and a half hour interview as MP3 files, along with the 54-page PDF transcript. Put the audio files on your iPod or burn them to CDs and listen on the go. Print out the transcript, make notes, and highlight your favorite sections. LIMITED TIME OFFER: For a short time, we'll give you this in-depth audio interview for only $19.95 USD. Think about it. Even if it only led to a single $500 gig, you'd make back 25 times what you spent on it. That's not a bad return on your investment. How to Tap Into the Lucrative College Music Market comes with a Six-Month Money-Back Guarantee. Take up to six months to apply these college booking strategies and decide if they're helping you book more gigs and make more money. If you're not happy, for any reason, just let me know and I'll give you a fast, friendly refund. No questions asked. To your well-paying college gig-booking success! as soon as your order is approved!